I’m not gonna lie, my efforts to dress up are pretty minimal at the moment… denim + Stan Smith + cashmere jumper combo and an oversized coat from Monki, I bought during my last trip in Paris and my usual Chanel lipstick. While it’s all good to take time off personal styling, I didn’t want to completely switch off, so last time Steve went back to London, I asked him to bring back a few of my clothes. Living between two countries is not as glamorous as it sounds, personally, I never have the thing I need in the right country but I have at least, started scanning some of our paperwork to have them with us wherever we are (if you have other tips, please do share). 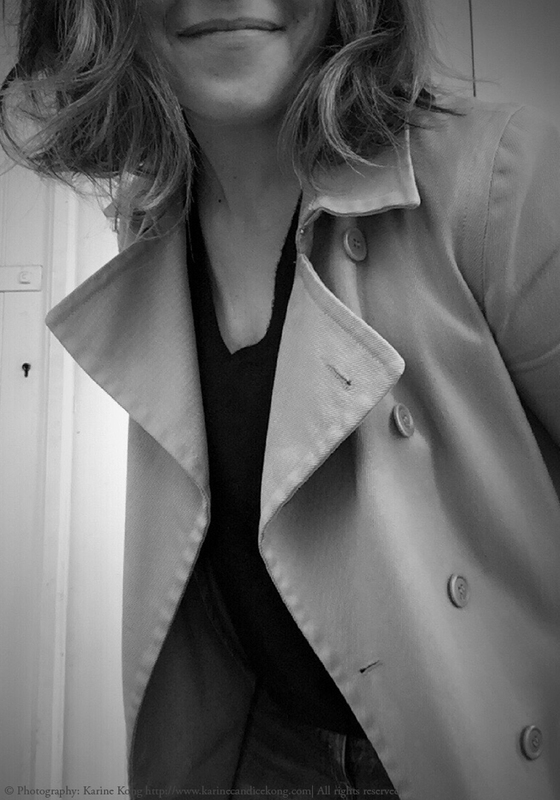 So on his return, I re-acquainted myself with the trench coat I bought from Comptoir des Cotonniers a few years ago. Yes the one I almost got rid of last year when I was having a closet cleanse until my mum said “don’t, it’s a timeless piece, you will wear it again”. As usual, she was right. How many times is your mother right!? (I would love to know :-) Enter the classic trench, which Jane Birkin and François Hardy wore so well in the 70’s, to update my look so I could wander the streets of Bordeaux and Paris, looking very French, talking about life with my friends or my sister, listening to Vanessa Paradis (if you’ve missed the news, she is Guest Editor of the French Vogue Christmas Edition) Mila wears one from Pepe Jeans available from Smallable above. My bag is from Zadig & Voltaire. You can get also old collections from Comptoir des Cotonniers on second-hand luxury websites like Vestiaire Collective and Vide-Dressing but if you’re not into second-hand fashion, here are some of my favourite trench coats. This is really good collection. Thanks for sharing. Karine, how gorgeous are you lady? !